I am really enjoying the KJV Know the Word Study Bible. This Bible offers a book-by-book, verse-by-verse, or topic-by-topic study of God’s Word. In addition to the insightful study paths offered, I also appreciate the concordance and maps that are included. I have utilized the verse-by-verse approach and look forward to continuing to implement the other approaches in my studies. While I haven’t studied this Bible in depth yet, I am aware that the commentaries it contains are based on opinion, and I will use discernment when reading these passages. Easy to read and understand, this study Bible provokes thought as it beckons readers to explore God’s Word. 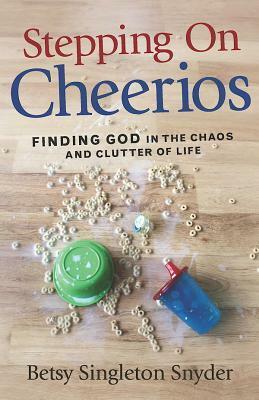 The study of God’s Word can be easy and rewarding if you break down the Bible into easy-to-understand segments. 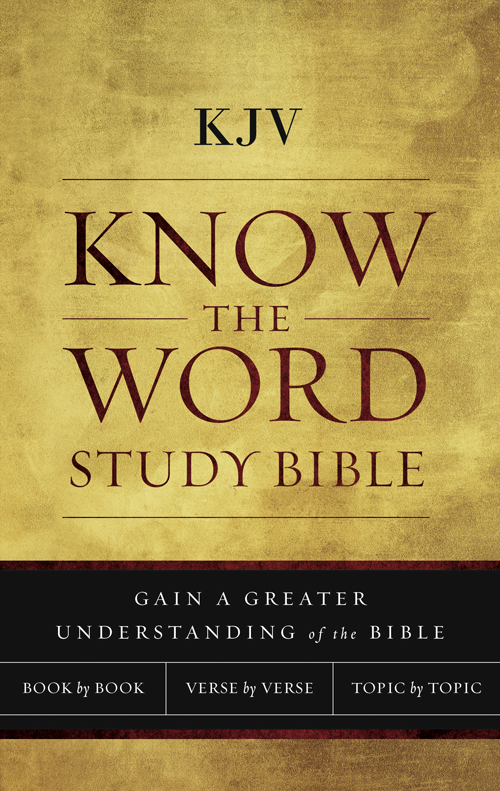 The KJV Know the Word Study Bible offers three easy ways to begin studying Scripture and helps individuals transition from being a casual reader of the Bible to becoming a regular student of the Bible. You can choose to study the Bible book-by-book, verse-by-verse, or topic-by-topic; each path offers powerful insights that will help you develop a daily routine of Bible study. The book-by-book series of notes leads you through the main points of each book of the Bible. The verse-by-verse notes help you to dig deeper into God’s Word. The topic-by-topic articles, which cover 21 theological topics, guide you through a series of insightful notes and give you a thorough biblical understanding of each topic. With the beautiful and timeless text of the KJV translation, the KJV Know the Word Study Bible offers you choices of how to study Scripture and grow in your relationship with Christ. Read what other bloggers are saying. Kelly Young wants to heal after losing her husband and to raise her little girl the best she can in her hometown. But her new neighbor, former wide receiver Brandon Carmichael, seems to intend to demolish his fixer-upper and her hopes for peace and quiet. 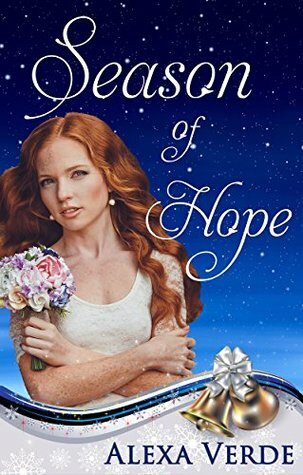 When he helps her to repair her home, keeps her flower shop business afloat, and makes her hope and love again, could it be that Brandon is exactly what she needs? After a forced retirement, Brandon Carmichael is angry and lost, one step away from the familiar path of self-destruction. Moving to a small town at his friend’s suggestion, Brandon surprises himself by getting involved in its community and starting to fall for his pretty neighbor, single mom Kelly Young. 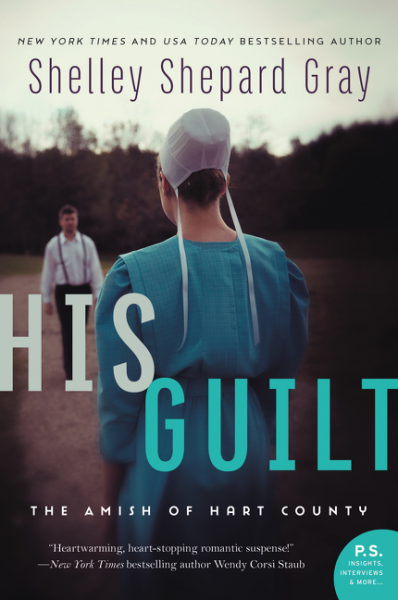 But when his past collides with his present, can he forgive, love, and live fully again? 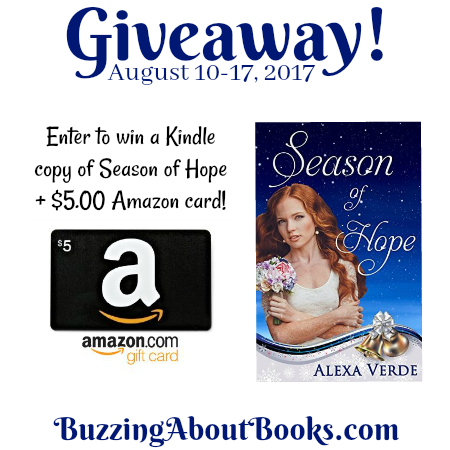 Thanks to the generosity of Alexa Verde, one lucky commenter will win a Kindle copy of Season of Hope and a $5.00 Amazon gift card! Prizes will be gifted through Amazon, so commenters must have an Amazon account. Leave a comment letting us know where you stand on fixer-upper projects. The giveaway ends Thursday, August 17 at midnight CDT. The winner will be chosen and announced on Friday, August 18. ◦Odds of winning are based on the number of entries. Are you a do-it-yourselfer or do you leave projects to the professionals? Do you have a fixer-upper story to share? Grounded Hearts is an engaging tale! Dickson intrigued me with the historical details of WWII Ireland, and I delighted in the richly drawn time period and setting. Nan and Dutch, as well as the village inhabitants who aid them, are well-developed characters, and the story that unfolds is rife with drama, danger, and romance. While there are aspects of the novel that some may find impertinent, the overall story line is one I enjoyed. What do you get when you mix World War II, a brave midwife, a wounded pilot, and a risky secret? 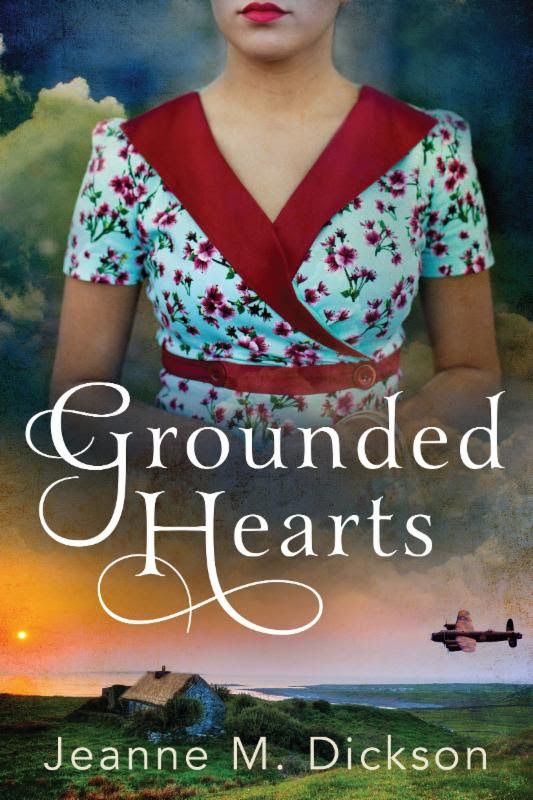 Jeanne M. Dickson’s new historical fiction novel, Grounded Hearts. When midwife Nan O’Neil finds a wounded young Canadian pilot at her door, she knows she’s taking a huge risk by letting him in. Still, something compels Nan to take in “flyboy” Dutch Whitney, an RAF pilot whose bomber has just crashed over County Clare. While she tends to his wounds and gives him a secret place of refuge, the two begin to form a mutual affection-and an unbreakable bond. Still, something compels Nan to take in “flyboy” Dutch Whitney, an RAF pilot whose bomber has just crashed over County Clare. While she tends to his wounds and gives him a secret place of refuge, the two begin to form a mutual affection-and an unbreakable bond. Read what other bloggers are saying about Grounded Hearts. Sword of the Matchmaker is an enchanting tale! Filled with action and adventure, Debbie Lynne Costello captures the medieval times and brings the story of Penelope Beatty and Thomas Godfrey to life. I enjoyed Penelope’s strong, determined personality which contrasts with Sir Thomas’s protective nature and heroism. Their story delighted me, as did reuniting with Lord Royce and Lady Brithwin from Book 1, Sword of Forgiveness. I loved this beautifully written romance and am eager to continue the Winds of Change series! I received a complimentary copy of this novella. No review was required, and all thoughts expressed are my own. Thank you for visiting my blog on the Sword of the Matchmaker tour! There are two more blog stops to look forward to! Leave a comment or ask Debbie a question to be entered! The giveaway ends Friday, June 30 at midnight CDT. The winner will be chosen and announced on Saturday , July 1. WAIT! THERE ARE MORE WAYS TO BE A WINNER!! Click here to enter the blog tour giveaway for your chance to win a Kindle Fire, Amazon gift card, and more! Debbie Lynne Costello has enjoyed writing stories since she was eight years old. She raised her family and then embarked on her own career of writing the stories that had been begging to be told. She and her husband have four children and live in upstate South Carolina. She has worked in many capacities in her church and is currently the Children’s Director. Debbie Lynne has shown and raised Shetland Sheepdogs for eighteen years and still enjoys litters now and then. In their spare time, she and her husband take pleasure in camping and riding their Arabian and Tennessee Walking horses. Penelope Beatty made up her mind long ago she would live and die a Scottish warrior not a wife. But when nearly all her clan is killed and she is betrayed, she loathes doing the unthinkable, but must seek the help of an Englishman who owed her father his life. 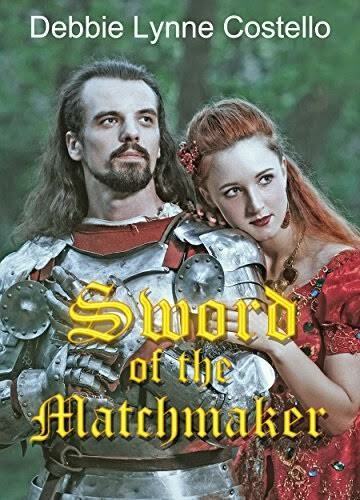 Purchase a copy of Sword of the Matchmaker. 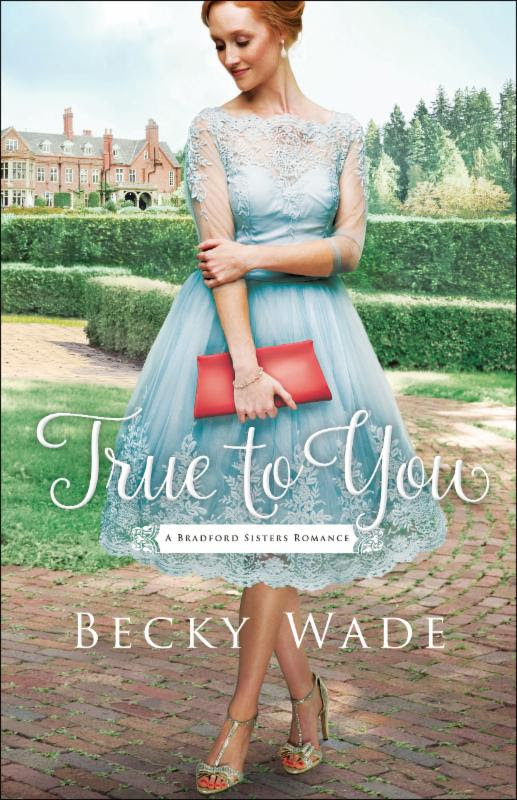 A perfect balance of lighthearted humor and meaningful emotion, True to You is a most enjoyable read! I loved the characterization of the Bradford sisters and their unique family dynamic. Nora Bradford is a librarian and historian, and I found her bookish persona quite endearing. John Lawson, former Navy SEAL, is a chivalrous hero, and I delighted in the pairing of these polar opposites. Theirs is a clever and charming romance that leaves me eager to continue this exciting new series!